The Vice-Chancellor, Professor Olusola Oyewole, has re-affirmed the current administration’s commitment to providing a focused, transparent and disciplined leadership for the University. The Vice-Chancellor stated this at the recently-held Statutory Meeting of Congregation, where he re-iterated his commitment and presented the University’s achievements since he assumed office. The Vice-Chancellor said he took over the mantle of leadership of the University twenty-five months ago with a vision, “to promote the advancement of FUNAAB towards a world-class status by providing a visionary leadership, empowering the human capacity, promoting quality and excellence in teaching, and research for development and community engagement for societal impact”. According to him, researchers in FUNAAB had become global players in their chosen fields by winning various laurels, while over 200 Academic and Non-teaching Staff had been given opportunities of traveling out of the country to attend several international conferences and meetings. 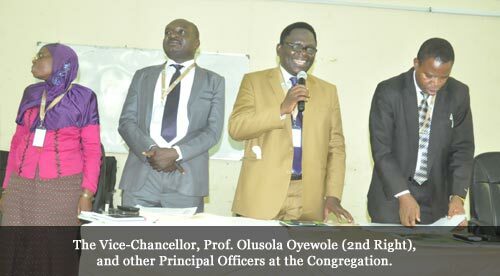 On leadership, Professor Oyewole noted that leadership was strategic in development and expressed satisfaction that the leadership provided by Principal Officers, Deans, Directors, Heads of Departments and Units in the University had been built on the values of excellence, integrity, discipline. While appreciating everyone who had contributed to what he described as the modest achievement of the University, the Vice-Chancellor said, “we have proved that we can rule with the fear of God and provide great leadership for our people and fulfil the causes and visions that we have set for ourselves”. The Vice-Chancellor disclosed that in promoting good leadership that is based on integrity; his administration had attracted unpleasant reactions but assured all that the University would keep moving forward. 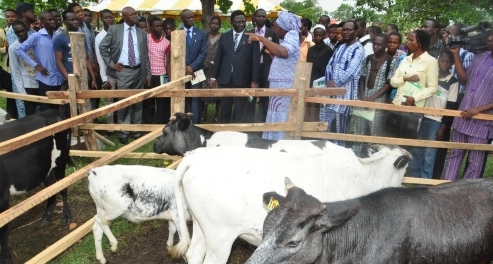 Highlighting some of the achievements of the University, the Vice-Chancellor said the Centre for Innovation and Strategy in Learning and Teaching was a new office, which emerged from the former Webometrics Centre while the Centre for Entrepreneurship Studies (CENTS) was another innovation that would assist FUNAAB graduates to acquire skills and competences in addition their degrees. Professor Oyewole said the Industrial Park Unit had been transformed into new enterprises for better services delivery, as FUNAAB Fisheries, FUNAAB Bakery, FUNAAB Seed and Nuts Company, FUNAAB Drinks, FUNAAB Oils, FUNAAB Roots and Tubers Company and FUNAAB Water, among others. Others include the introduction of Commencement Lecture, Professors’ Retreat, leadership training seminars and workshops, producing a new Strategic Plan (2014-2020), prompt production of the University’s Annual Reports and new Rules and Regulations for Senior and Junior Staff and Career Structure in the University. 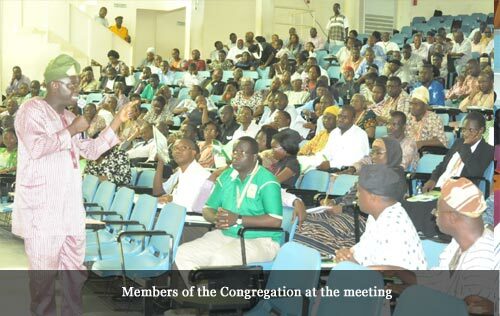 The Vice-Chancellor said the Congregation Meeting was a forum to get new and great ideas from stakeholders, explain emerging developments, share joint hopes and aspiration for the future, as he disclosed that the University would also be organising a Parents’ Forum, as part of activities lined up for its Convocation Ceremonies.